Nothing about clowns seems to add up. Were they ever funny? People seem to think that at some point during human history, clowns were amusing, but we can’t even remember the last time that we found one to be entertaining. They’re usually more terrifying than anything. That’s why we think it’s best if we stop trying to perpetuate this idea that clowns are humorous and just embrace the fact that they’re creepy beings that deserve to be the subject of horror movies. And we think that you’re the right girl for that job! The first step to making sure that the world stays terrified of clowns is getting the right look. 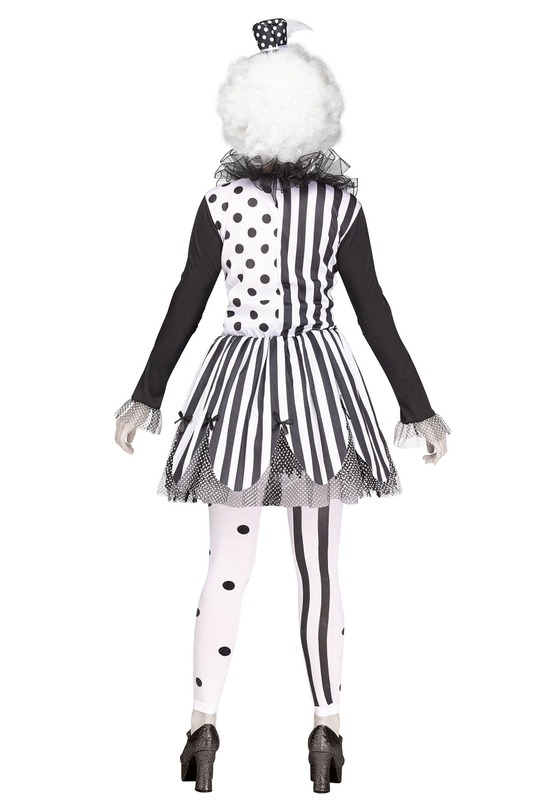 This Killer Clown costume for women is the right start. It comes with an asymmetrical black and white toned dress. The footless tights have a polka dot theme on one leg and a striped theme on the other, which perfectly matches the dress. Just place the matching hat on your head and you’ll be ready to “entertain” a few victims! Of course, you won’t want to stop there with your look. If you really want to keep the audience utterly speechless, then you’re going to need a few extra accessories. A set of makeup will let you create your own unique and gruesome clown-face and nothing tells the audience that you’re a straight nightmare like a toy knife accessory. Combine those with this clown costume and no one will remember why clowns were every considering funny in the first place.